White House press secretary Sarah Huckabee Sanders insisted on Friday that despite the “Russian Witch Hunt Hoax” doing “very well,” President Trump canceled his meeting with Russian President Vladimir Putin over Russia’s aggression in Ukraine. President Trump on Monday floated the idea of creating a state-run news network called to counter CNN. President Trump brushed off a question on Friday about whether his recent tweet-storm against the Mueller probe was a sign of agitation over the investigation. “We want total freedom of the press … we’re setting up a certain standard, which is what the court is requesting,” Trump said, according to a White House pool report. 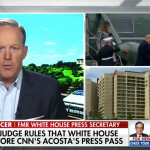 Former White House press secretary Sean Spicer said Friday he was “a little shocked” that a judge ordered the White House to reinstate CNN reporter Jim Acosta’s press credentials. “Obviously whether he has access or not, he, like so many other journalists, can write about the White House or any subject they deem necessary or of interest,” Spicer added. A judge issued a temporary ruling on Friday to reinstate Acosta’s press credentials. 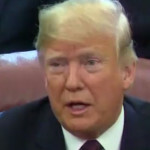 The White House stripped Acosta’s press pass after the reporter clashed with President Trump at a contentious press conference. The White House initially claimed it took away Acosta’s pass because he touched a press intern trying to grab the microphone from him. CNN sued to reinstate Acosta’s credentials.